A beautiful town house: standing on this ever-popular tree-lined avenue, perfectly positioned for the nearby town, harbour, seafront and beaches, 'hidden' behind delightful front gardens, providing intriguing and beautifully presented 4-bedroomed accommodation, arranged over 3 storeys, full of charm and character, with an exquisite, extremely sunny, surprisingly private and beautifully stocked rear garden, beyond which is the further benefit of a garage. A home not to be missed! Number 16 Woodlane is one of those rare finds, combining period living complemented with contemporary features, beautiful gardens which are sunny and surprisingly private, garaging and convenience with all of Falmouth's acclaimed amenities 'on the doorstep'. Set behind beautifully stocked southerly-facing front gardens, which provide a degree of privacy from this tree-lined avenue, a columned entrance provides a charming introduction to the accommodation which in brief comprises: a deep reception hall, 'double' reception room with two fireplaces, both with glass-fronted log-burners, magnificent family sized kitchen/diner with vaulted ceiling, and useful under-stair utility 'closet'. An elegant staircase leads to a mid-landing, off which there is a highly adaptable fourth bedroom/study and from the main landing, further pitched pine panel doors lead to two double bedrooms and an attractively appointed family bathroom/WC with white suite. 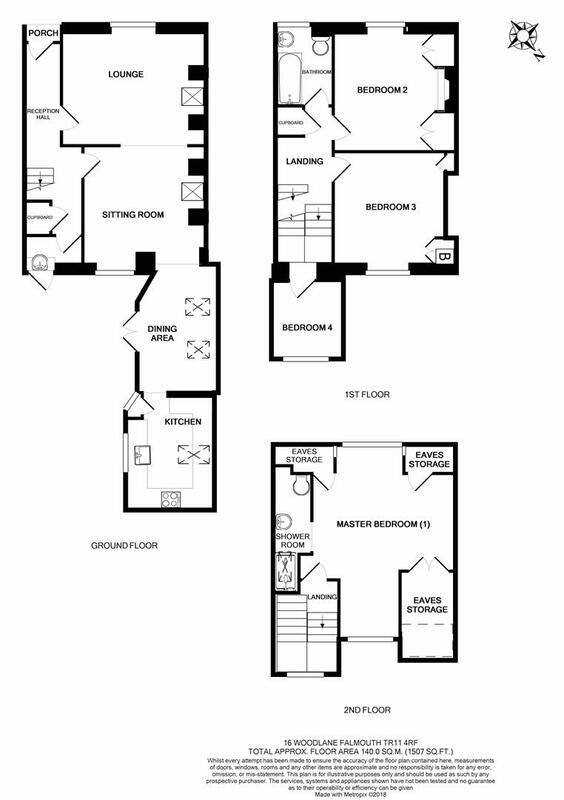 On the top floor, there is a magnificent master bedroom suite with dormer windows to both front and rear elevations and, off which, is a contemporary shower room/WC. All front-facing rooms have an attractive outlook over the gardens and there are glimpses through the trees to Falmouth bay beyond. To the rear, direct access is provided from the open-plan kitchen/diner onto a pretty courtyard which leads to the stunning, sub-tropical rear garden which, again, are well enclosed, beautifully stocked, extremely sunny and beautifully landscaped. A glass-fronted summerhouse with veranda sits at the foot of the garden and enjoys a lovely outlook back towards the house, and to the side of which, a pedestrian gateway and path, shared with just one other property, leads to a garage, middle of a row of three, situated on Florence Place. With features, quality and character too many to mention, we unhesitatingly recommend interested prospective purchasers arrange an early viewing appointment. Exposed timber floor throughout, moulded ceiling cornice, archway at mid point, high level cupboard with modern consumer unit, pitched pine panel doors to the reception room. Radiator. Elegant turning staircase rising to the first floor. Located to the rear of the reception hall with doorway (now shut) to the rear courtyard. Fitted with a wash hand basin with mixer tap and space for an automatic washing machine. Ceramic tiled flooring, adjacent under-stair cupboard housing the tumble dryer. A stunning 'double' reception room, with exposed mellow timber flooring throughout and moulded ceiling cornice. Sash-style casement window to the front elevation enjoying a pretty outlook over the attractively stocked front gardens. Open fireplace with inset glass-fronted log-burner and shelved recesses to either side. Radiator, telephone point, dimmer switching, TV aerial lead. Second measurement widening to 9'0 (2.76m) in the kitchen area. A magnificent family sized living, cooking, dining and entertaining room, with vaulted ceiling throughout with triple Velux roof lights providing much natural light. Exposed mellow timber flooring, double glazed casement door with matching side screen opening onto the rear courtyard, radiator. Most attractively appointed with a comprehensive range of hand-built bespoke kitchen units with ample timber worksurfaces and complementary tiled splashbacks with concealed pelmet lighting. Open fronted wall cupboards/display shelving, recess for tall fridge/freezer, ceramic butler-style sink with mixer tap. Recess with plumbing for automatic washing machine, wine rack and tray recess. Space for cooker with Baumatic stainless steel splashback and illuminated extractor canopy over. Broad window with slate sill to the side elevation, internally glazed broom/storage cupboard, ceramic tiled flooring, telephone point. Broad double glazed window to the rear elevation enjoying an attractive outlook over the deep rear gardens. Exposed timber flooring, radiator, dimmer switching. A versatile room, currently used as a study/studio. Attractive turning staircase continuing to the second floor, pitched pine panel doors to the first floor rooms and to a large built-in linen cupboard with slatted shelving. Again, featuring an exposed mellow timber floor. Sash window to the rear elevation, picture rail, radiator, dimmer switching, built-in cupboards including boiler cupboard housing Worcester 35CDi gas fired boiler providing domestic hot water and central heating. Another attractively proportioned room with mellow timber flooring, exposed bedroom fireplace, picture rail, dimmer switching, radiator. Twin built-in full-height cupboards with storage lockers over, sash window to the front elevation overlooking the front gardens and with glimpses through the trees along Woodlane to Falmouth Bay. Attractively appointed with a white three-piece suite including a low flush WC, pedestal wash hand basin and panelled bath with hand grips and mains-powered shower over with folding glazed screen. Picture rail, part tiled walls, exposed mellow timber flooring, towel rail/radiator, second radiator, part obscure glazed window to the front elevation. A contemporary white suite with wall hung wash hand basin with concealed cistern, ceramic sink with mixer tap, and walk-in fully tiled shower cubicle with Velux roof light over. Ceramic tiled flooring. 16 Woodlane enjoys a high degree of privacy from this sought-after tree-lined avenue, 'behind' beautifully stocked front gardens with timber pedestrian gate and slate pathway to the canopied entrance. Well enclosed to both sides by mature hedging, lawned area enjoying a large degree of sunshine, and beautifully stocked border with various specimen plants including azaleas, acers, roses and willow etc. Partially cladding the front elevation is a highly productive fruit tree. With raised planters, again, well enclosed to both sides by mature hedging and stone walling, lawned, and with pathway to a large summerhouse with covered veranda, facing south westerly, and enjoying a lovely outlook along the length of the garden back to the house. External measurements provided. To the side of the summerhouse there is a timber log store and pedestrian gate which leads along a pathway, shared with just one other property, leading to the garage. The middle of three garages, of sectional concrete construction, to the rear of which, there is a useful storage area. Mains electricity, water, drainage and gas are connected to the property. Telephone points (subject to supplier's regulations). Gas fired central heating. Upon entering Falmouth, continue along with the A39 following the signs to the seafront and beaches. At the foot of Western Terrace, immediately after 'The Merchants Manor', turn left at the mini-roundabout, onto Woodlane. Continue along this tree-lined avenue passing Albany and Trelawney Roads on the left-hand side, after which the pedestrian entrance gate to Number 16 will be found on the left-hand side, before the left-hand turning into Wodehouse Terrace.